Argentina went to the polls on October 22, in what many saw as a crucial mid-term test for President Mauricio Macri and the right-wing coalition behind him, Cambiemos (Let’s Change). In the end, Cambiemos came out strengthened, while the Left and Workers Front – an alliance of revolutionary parties – continued to build on its previous electoral successes, winning 1.2 million votes. 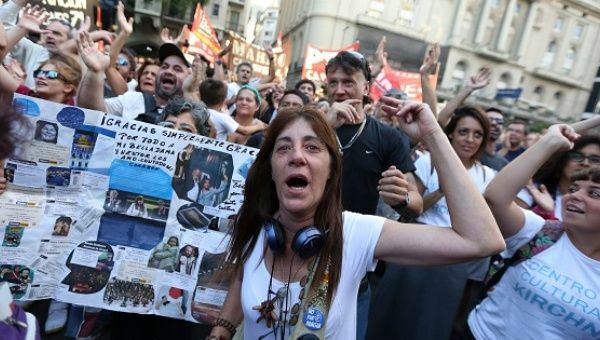 Protest in Buenos Aires against Macri government's public sector layoffs, January 29, 2016. Phot: TeleSUR. The government of Argentina is seeking to take pan-American TV station TeleSUR off the air, in a move the broadcaster said on March 28 amounts to censorship. Latin American social movements have already condemned the move by the South American nation's new right-wing President Mauricio Macri. Every year from around Christmas through to February, Argentina is wrapped in a summer trance. The usual, frenzied pitch of city centres is muffled as if by vast blankets of cotton and sticky heat. Families find reprieve from work by travelling to the coast and mountains, visiting distant family and towns in the interior. This lull often translates into a dialling-down of class struggle. There are fewer and smaller mobilisations, strikes and political activism.